6.) 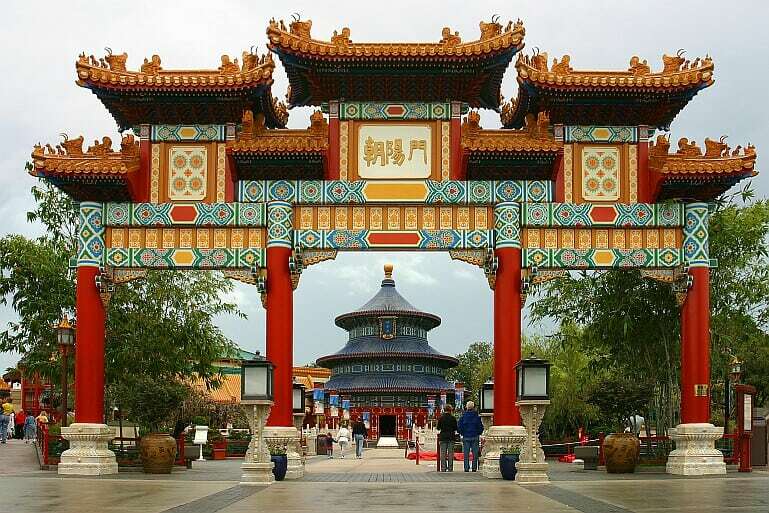 China Pavilion – Another popular pavilion in Epcot’s World Showcase draws guests in with beautiful architecture and the perfect combination of dining, entertainment, and attractions. The China Pavilion is home to popular experiences such as the Nine Dragons Restaurant and circle vision film Reflections of China and guests who spend time in the area can take in many different details that help to bring the spirit of China to life. While some guests might spend plenty of time exploring the China Pavilion, many miss lots of amazing details by only staying in the front of the pavilion near the shores of World Showcase Lagoon. Those who travel to the rear of the China Pavilion can enjoy a large shopping location called Good Fortune Gifts that also features an exterior courtyard area where the Kidcot Fun Spot is set up. Nearby is also a pressed penny machine that offers guests the option of Goofy in front of the Pavilion with the words “good luck,” Donald with the word “strength,” Mulan with Spaceship Earth in the background, and Goofy pulling a rickshaw with Minnie and Mickey inside.